Fighting gigantic demons from the underworld is all in a day’s work for the Devil May Cry crew. 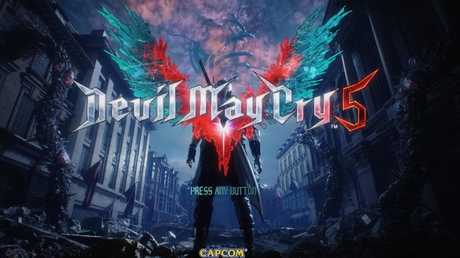 While Doom is one of the best-known examples for many gamers, the venerable Devil May Cry series from Capcom has been providing plenty of demon-smiting adventure for the past 18 years and has a legion of dedicated fans - nearly all of whom should be very pleased with the latest instalment in the series, Devil May Cry 5, which has released for PC, PlayStation 4 and Xbox One. The series follows the adventures of demon hunter Dante and his friends as they - wait for it - hunt and fight demons around the world. There's also a plot about Dante being part demon himself, and his complicated family history, but you don't need to know any of that heading into this game. Devil May Cry 5 is the latest addition to the series and it is very good. Devil May Cry 5 looks jaw-droppingly amazing too, with the best character animations I can recall seeing in a game - incredibly smooth, fluid, and lifelike. It's a spectacularly cinematic game that's almost as fun to watch as it is to play. If, like me, your knowledge of the series is "something something demons something something big sword", Devil May Cry 5 has a short video available to fill you in on the story of the previous four games. I appreciated this touch, even if I stopped worrying about the intricacies fairly soon after cleaving my first demon in twain with a sword the size of a C-130H Hercules transport aeroplane propeller. The basic formula is fairly standard stuff - navigate a level, stop to beat the stuffing out of baddies (as a score counter on the side ranks your performance) then you carry on and repeat the process, culminating in a boss fight. I should find it all rather tedious and boring, but I didn't. Devil May Cry 5 isn't afraid to have some fun and the fact it's not trying to make a serious political statement or send a message meant I was able to spend several enjoyable hours slashing, shooting and blasting my way through hordes of the underworld. This is, after all, a game where one of your weapons is a motorbike that turns into swords. It's not going to win the Palm D'Or at Cannes for its nuanced addressing of postmodern ennui, because it's far too busy blasting heavy metal while you slice and dice and shoot and generally have a good time - something even the game gets in on with some of its more oddball moments. The setting looks like London, but isn’t. Even though it looks a lot like it. You play as three characters - Nero, V and Dante. Much like the Def Leppard's drummer Rick "Thunder God" Allen, Nero only has one arm, while V has a strong emo image thing happening and Dante combines swordplay and gun fighting in a package that's exactly as awesome as it sounds. They are joined by a strong case of supporting characters including the chain smoking mechanic Nico, who can get her van to literally anywhere it's needed and V's wisecracking familiar Griffon. 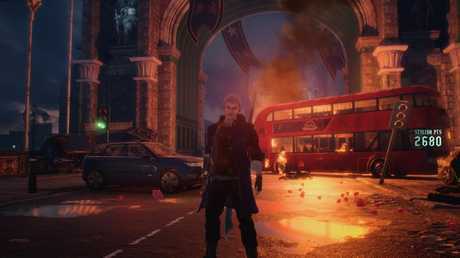 The plot is something to do with a demonic entity attacking the city of Redgrave, which looks almost exactly like London. This entity has manifested itself as a giant evil tree called the Qlipoth, which feeds on human blood to nourish itself. 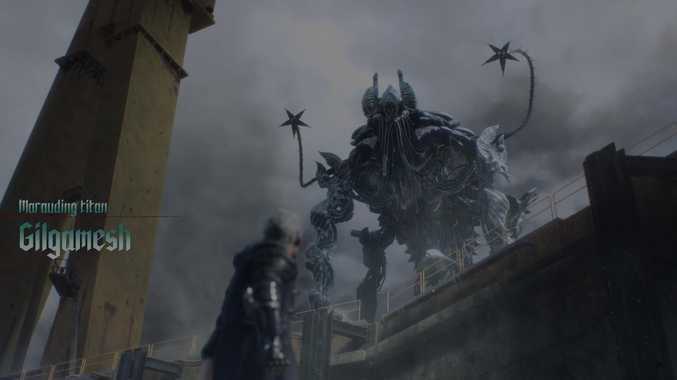 While its endgame isn't actually expanded on, beyond being a huge tree that is evil and destroying a city, there is a very large demon living in it that is also evil and needs to be stopped, which is where the Devil May Cry crew (and by extension, you) come in. 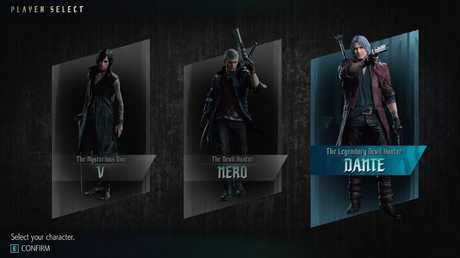 There are three characters to play as, each with different powers and abilities. Being a button masher game designed for console controllers, I naturally decided to play review it on PC with a mouse and keyboard the way God intended games to be played, and the control scheme worked really well - I had no trouble at all pulling off impressive and effective combos of the "leap in the air, cleave some demon in twain with an improbably large sword, then unload a 12ga shotgun into their face" variety, even though one would think human hands lacked enough fingers to make this possible. Plugging a controller in provided a similarly button-mashingly entertaining experience, so no matter what your platform or input method, you're going to be able to get thoroughly medieval on the denizens of the underworld using an array of swords, guns and magic power-ups without any trouble at all. It's not a spectacularly long game - maybe 15 hours or so at most - but it's a tight experience and knows full well that padding the game out would detract from the experience. In fact, it's one of the tightest games I've played in ages and I was impressed by the pacing overall - I was never bored, never left wondering what to do, never unsure where I needed to go. The major flaws I encountered were a couple of supporting characters were made out to be significant and important then pretty much had nothing to do for the rest of the game, and on "Human" difficulty level the game isn't especially hard - it's more about hitting those buttons and doing sweet combos, since the enemies aren't particularly challenging. Some of the writing is a bit cheesy too, and I couldn't always tell if it was intentional or the developers just figuring people weren't playing the game for its script. I had a lot of fun with Devil May Cry 5 and in a release calendar packed full of large, serious games it's been great to play something uncomplicated, stylish, and rewarding. Make some time to check it out - I don't think you'll be disappointed. Nico the mechanic can make your characters pretty much anything they need, from cybernetic arms to guns to helping boost your abilities. Also her van can go pretty much anywhere, which becomes a running joke in the game.